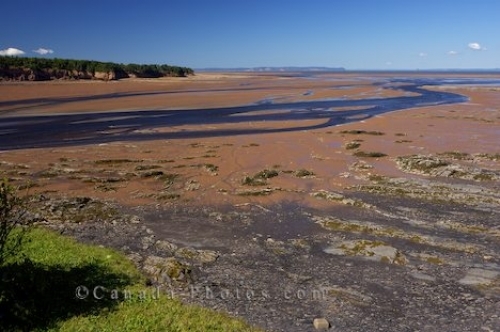 When the tide is at its lowest point, the Minas Basin in Nova Scotia, Canada becomes scattered with seaweed, rocks, sand flats and intertidal mud leaving behind small channels of waterways. Low tide on a summer day is one of the best times to view the scenery where the tops of the cliffs flourish in lush greenery and the horizon seems endless. Around or in the Walton Lighthouse in Nova Scotia, Canada, visitors can enjoy the scenery of the Minas Basin and have a closer look at the distinct patterns of the water meandering around the sand flats. The Minas Basin is an inlet in the Bay of Fundy where various species of wildlife reside. Picture of the scenery of the Minas Basin in Nova Scotia, Canada at low tide as seen from the Walton Lighthouse. ... A fascinating place to stop while traveling along the Fundy Shore Ecotour in Nova Scotia, Canada. Low tide in the Minas Basin seen from the Walton Lighthouse, in the town of Walton, Highway 215, Fundy Shore Ecotour, Glooscap Trail, Nova Scotia, Canada.